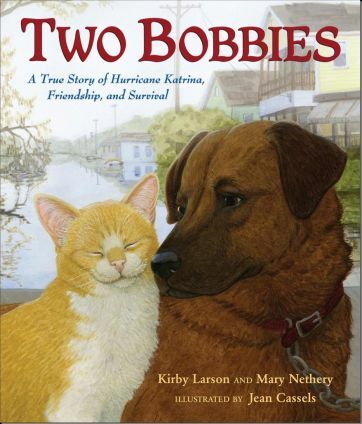 Kirby Larson is the acclaimed author of the 2007 Newbery Honor Book, Hattie Big Sky, a young adult historical novel she wrote inspired by her great-grandmother, Hattie Inez Brooks Wright, who homesteaded by herself in eastern Montana as a young woman. Just released—due to popular demand by her readers—is Hattie Ever After, the final installment in Hattie’s adventures. Her passion for historical fiction is evident in The Fences Between Us and The Friendship Doll, as well as a fall 2013 title, Duke. She is at work on a companion novel to Duke as well as a novel set in 1910. 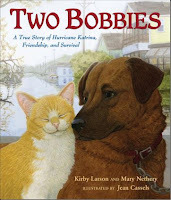 In 2006, Kirby began a collaboration with her good friend, Mary Nethery, which has resulted in two award-winning nonfiction picture books: Two Bobbies: A True Story of Hurricane Katrina, Friendship and Survival (illustrated by Jean Cassels) and Nubs: The True Story of a Mutt, a Marine and a Miracle. They think three’s a lucky number so have their eyes peeled for another project to tackle together. 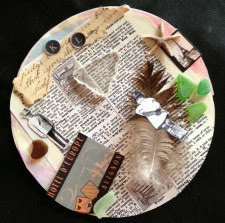 Kirby explains her dot, "The inspiration for this collage came to me while doing one of my favorite things: beach-combing. So you'll see six pieces of glass that I've found on our beach (a real feat on our rocky Washington coast). I am a hopelessly amateur birdwatcher, but enjoy collecting feathers -- one of my treasures is an Eastern Turkey feather sent to me by my friend, Barbara O'Connor. The feather on this dot, however, is from a Western gull (I think). Aside from the beach, another of my happy places is France; you can see the old fashioned luggage sticker for Hotel D'Europe, in Avignon, as well as the Tour Eiffel. My love for stories started with my parents, so I've included little cut-outs of them as children, to reflect my passion for telling stories for children. History fascinates me so there is a snippet from an old letter, and a page from an old dictionary; I've placed the white piece of beach glass over the word, "write." Art should be signed, right? This dot is "signed" with my initials, photographed from old typewriter keys (I have a mini-collection of old typewriters)." Learn more about Kirby on her website.